+ + +: Space Saver. New Yorkers are eternally seeking small yet stylish furniture to fit into their insanely small apartments. This new piece of furniture has a bed, a desk, and a kitchen table in one.... one word ----amazing. 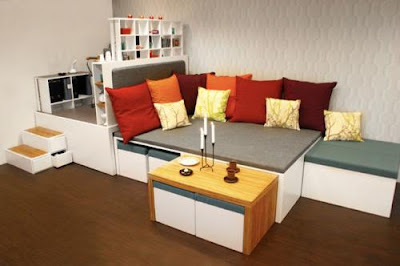 Via "a compact living concept" one again swedes are awesome.